We always hear from patients worried about getting a flu vaccine. After all, the flu has been around for our entire lifetimes and most of us have had the flu at some point. Today, however, fighting the flu is simple and safe. Here are four common myths of the flu and the flu shot from the Vermont Health Department. There should be no excuses to get your flu show as soon as they are available, and at FPG they are available now! Myth: The flu isn't a serious disease. 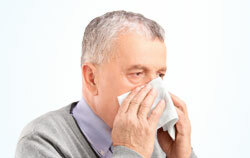 Fact: Influenza is a serious disease of the nose, throat and lungs, and it can lead to pneumonia. Each year about 100,000 people in the U.S. are hospitalized and about 36,000 people die because of the flu. Most who die are 65 years and older. But small children less than two years old are as likely as those over 65 to go to the hospital because of the flu. Myth: The flu shot can cause the flu. Myth: The flu shot does not work. Fact: Most of the time the flu shot will prevent the flu. In scientific studies, the effectiveness of the flu shot has ranged from 70 percent to 80 percent when there is a good match between circulating viruses and those in the vaccine. Getting the vaccine is your best protection against this disease. Myth: The side effects are worse than the flu. Fact: The worst side effect you are likely to get from the shot is a sore arm. The nasal mist flu vaccine might cause nasal congestion, runny nose, sore throat and cough. The risk of a severe allergic reaction is less than one in four million.